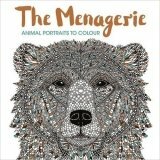 The Menagerie is filled with beautiful animal heads to colour and complete. Each wonderfully detailed piece is a work of art to be treasured by keen colourers and animal lovers alike. Printed on perforated paper, these incredible works of art can be easily pulled out and displayed. The book features bespoke artwork from Richard Merritt, one of the talented illustrators of the bestselling Art Therapy series.